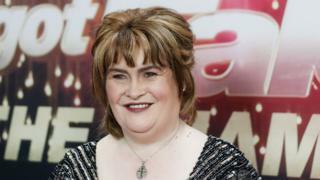 Britain's Got Talent stars Susan Boyle and Paul Potts have missed out on winning America's Got Talent: The Champions. The pair had made it to the final 12 but magician Shin Lim went on to triumph on Monday night. The contest brings back famous contestants from various global versions of the show over the past few years. Lim won the latest series of America's Got Talent (AGT) in September. America's Got Talent: The Champions saw 50 contestants compete in front of judges Simon Cowell, Mel B, Heidi Klum and Howie Mandel. County Durham teenager Courtney Hadwin, who reached the final of AGT last year, also competed in the champions version but went out in the earlier rounds. Boyle, 57, came second on Simon Cowell's Britain's Got Talent in 2009, behind winning dance group Diversity. Her first audition, a rendition of I Dreamed a Dream from Les Miserables, famously stunned the audience and judges alike. Since the show, the West Lothian singer has sold more than 20 million albums and had two Grammy nominations. Fellow singer Potts won the first series of Britain's Got Talent in 2007 and went on to release chart-topping album One Chance.